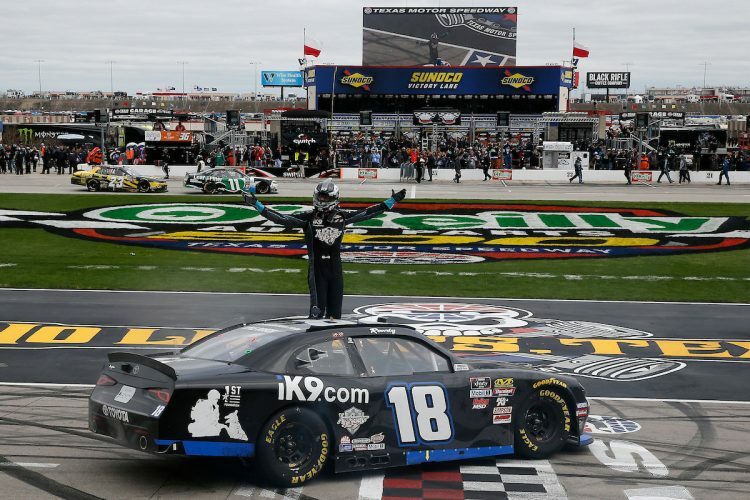 Kyle Busch positioned himself for another NASCAR tripleheader sweep Saturday afternoon with a workmanlike victory in the 23rd annual My Bariatric Solutions 300 at Texas Motor Speedway. Busch added his 95th career Xfinity Series victory and ninth around TMS’ high-banked/1.5-mile oval to his win Friday night in the Vankor 350 NASCAR Gander Outdoors Truck Series win. Next up is Sunday afternoon’s Monster Energy NASCAR Cup Series O’Reilly Auto Parts 500. Busch took the lead from Joe Gibbs Racing teammate Christopher Bell on pit road on Lap 192 during the race’s final caution period starting on Lap 190 of the scheduled 200, opting for fuel only in the No. 18 iK9 Toyota Supra. Bell’s stop included two right side tires on his No. 20 Ruud Toyota. Busch’s nine Xfinity Series wins at TMS includes a streak of five straight from 2008-2010. Busch bolted away from the field when the race went green on Lap 195 en route to finishing 0.861-seconds ahead of reigning series champion Tyler Reddick in the No. 2 Nationwide Children’s Hospital Chevrolet Camaro SS. Bell, who qualified on-pole at 191.320 mph earlier Saturday, finished third. He was followed by Chase Briscoe, Jeb Burton, Michael Annett, Justin Haley, Jeffrey Earnhardt, John Hunter Nemechek and Ryan Seig. Reddick, Busch, Noah Gragson, Bell, Burton, Cole Custer, Haley and Brandon Jones. Bell reprised his pole-winning effort from earlier in the day by leading all 45 laps of Stage 1. Bell was followed to the green/checkered flag by Busch, Justin Allgaier, Custer, Jones, Reddick, Austin Cindric, Brad Keselowski, Nemechek and Gragson. Busch won the first race off pit road while Bell was flagged for entering too fast, an infraction that dropped him from second to 19th.